Whether you drive an A4, Q7, R8 or any other Audi model, your tires were selected to provide superior performance and comfort. Audi performs extensive evaluations to determine which tires are best suited for each vehicle. 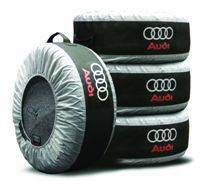 Whether your car requires Continental, Goodyear, Pirelli or another quality tire brand, you can trust that the Audi Tire Center includes the approved, recommended brands to deliver the best driving experience.